In early January 2012, the Scandinavian furniture retailer, IKEA, built an entire apartment in a Paris Metro station. IKEA, who are well know for producing, mass-producing flat-packed furniture, in multi-pull bright colours, a stable feature to any student house, yet in January, they created a whole apartment, completely furnished with there products, in the middle of a Paris Metro station. 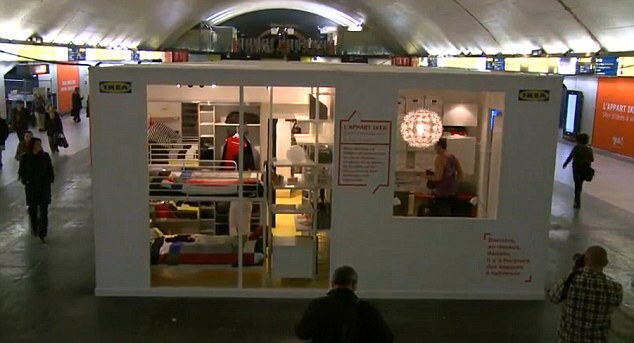 IKEA constructed the apartment inside the French capital's Auber station in a confined space of just 581 square feet. IKEA say 'the idea behind the apartment is to demonstrate how IKEA storage goods can make even the smallest flat comfortably habitable'. We think its a great PR stunt and has not only raised IKEA's profile in France, yet across the world. The story ran in almost all large newspapers in the UK and on-line, getting them great exposure. There has been a great time lapse released on YouTube, which further fules this brillant PR stunt, which is well worth a watch !